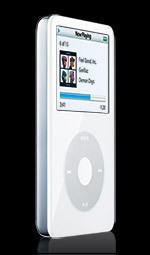 Most of the bad reviews on the iPod not lasting long are back to the original first and 2nd generation iPods when it had a battery defect (which has since since been settled), not by design. The hooha was blown out of proportion by users who feel they've been ripped off. Same with the iPod nano's 'all too easily scratched screens'. Having said that, any eletronic gadget don't usually last more than 2-3 years anyway, and a replacement is usually made in that time. I hope you enjoy your iPod video. Be sure to check iTunes for all the free terrific podcasts. 2-3 years? That is too short a time frame to own a gadget. My old Sony Discman still works. I suppose the iPod lasts as long as the lithium battery life .. it says we can't open the thing and try to remove stuff like the battery. For the price we pay, we expect it to last at least 5 years .. heheh. I'll check out the podcasts availabe at iTunes. Thanks for the heads up.